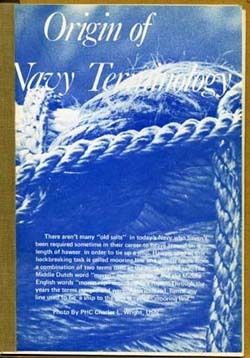 "Origin of Navy Terminology" reprinted by Naval Education and Training Program Development Center (Code ETM2) for use in the Naval Reserve Officers Training Corps "Introduction to Naval Science" curriculum. Original brochure developed in commemoration of the US Navy's 200th Birthday by the Navy Internal Relations Activity, Office of the Chief of Information, LT John W. Alexander, Director, Print Media Division. Recognition and thanks extended to JO2 Dan Wheeler for compilation. LTJG Bill Ray and Ensign Douglas Gray for artwork. Note: The only editorial change to the text has been the alphabetization of definitions for the convenience of readers. BINNACLE LIST Many novice sailors, confusing the words "binnacle" and barnacle, have wondered what their illnesses had to do with crusty growths found on the hull of a ship. Their confusion is understandable. CARRY ON In the days of sail, the officer of the deck kept a weather eye constantly on the slightest change in wind so sail could be reefed or added as necessary to ensure the fastest headway. Whenever a good breeze came along, the order to "carry on" would be given. It meant to hoist every bit of canvas the yards could carry. Pity the poor sailor whose weather eye failed him and the ship was caught partially reefed when a good breeze arrived. It wasn't until the 18th century that chaplains were permitted to dine in the wardroom. Previously, they messed in their own cabins although they were frequently invited to dine with the captain. CHEWING THE FAT "God made the vittles, but the devil made the cook," was a popular saying used by seafaring men in the last century when salted beef was staple diet aboard ship. In the 1920s, a comic strip character named Harold Teen and his friends spent a great amount of time at Pop's candy store. The store's name was the Sugar Bowl but Harold and company always called it the geedunk for reasons never explained. The term knot or nautical mile, is used world-wide to denote one's speed through water. Today, we measure knots with electronic devices, but 200 years ago such devices were unknown. Ingenious mariners devised a speed measuring device both easy to use and reliable: the "log line." From this method we get the term "knot." MOORING LINE There aren't many "old salts" in today's Navy who haven't been required sometime in their career to heave around on a length of hawser in order to tie up a ship. Hawser used in this backbreaking task is called mooring line and gets its name from a combination of two terms used in the early days of sail. The Middle Dutch word "maren" meant "to tie," and the Middle English words "moren rap" meant "ship's rope." Through the years the terms merged and were Americanized, hence any line used to tie a ship to the pier is called "mooring line." Blue has not always been "navy blue." In fact it wasn't until 1745 that the expression navy blue meant anything at all. *The American counterpart, the British sailor, was known as a “LIMEY” because of his consumption of limes while on the high seas. Scurvy is a disease caused by the deficiency of vitamin C, and the latter stages generally result in death. The British sailors historically consumed limes, a fruit known to be high in Vitamin C, to avoid the deadly condition. Scurvy can easily be avoided with proper diet, but because of the lack of fresh fruits and vegetables during the American Civil War, it was responsible for the deaths of thousands of Confederate soldiers.